This post is Day #7 in the 31 Days to a Better Work + Life Balance series. It never fails, whenever I need to find a document right away, it comes up missing. Last week I needed to know the time of an event at my son's school. There I was again, digging through piles and piles of paper, stressed and in a hurry. I didn't actually find it until I the very last minute and had to totally rearrange our schedule. Disorganization is stressful! I feel like so much time gets wasted sifting and sorting through paper clutter. I can't even tell you how many times a bill has almost been late because it was buried in the pile of mail I hadn't sorted. So if this is you too, no worries. All we really need is a system and a place for each type of paper. My system: the touch it once rule. This rule has been amazing for my house since I organized the clutter. Here's how it goes: The minute mail or paperwork comes in, it either gets put away or trashed. The items to put away go in one of three places: 1) If my husband needs to see it or it's for him only it goes in his folder. 2) If I need to fill out a form or pay a bill, it gets clipped to my clipboard. 3) Otherwise it gets filed away in a binder. We'll talk supplies below but making this rule helps to keep things from piling up. Go around your house and gather up all piles of paper. Dig it out of drawers, mail piles and sorter bins. My clutter was pretty bad so I was totally comfortable mixing piles, but if it would save you time to keep them separate, do that. See what kind of paper clutter you have and take notes. During my note-taking phase I found that my clutter was mostly one of these categories: Home Finances, Cards + Keepsakes, Business Forms, Kids School Papers/Artwork, & Printed Recipes. You might already have these or you might need to go purchase pretty versions for incentive! I picked up binders, dividers with pockets, clipboards, folders, and a three-hole-punch. I knew I needed 4-5 binders for the categories above. I also needed a "deal with this" clipboard for things that I have to get to immediately, and a folder for my husband's stuff to go into. 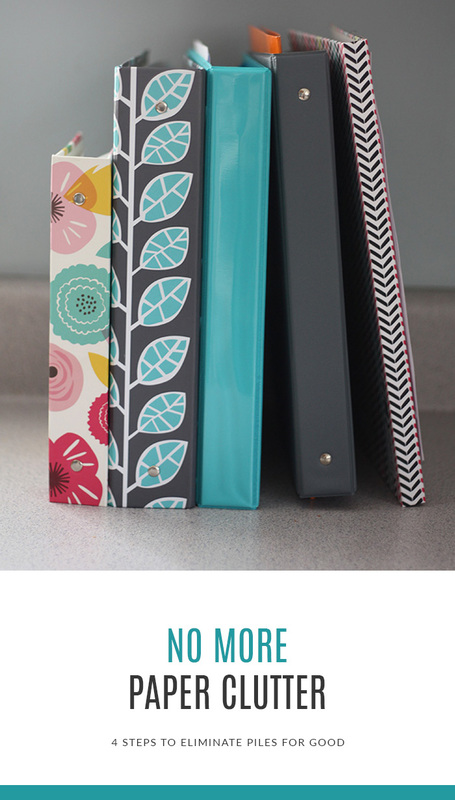 I chose dividers for my binders with pockets because I knew that I'd be filing things quickly. I didn't want to stop and three-hole-punch papers daily, but I'd want it to be in the right place. So slipping it in its correct divider pocket is a good solution until I can punch more at once. This is the tedious part but you can make yourself do it quickly. Keep a trash can and shredder nearby if you have one. Lay out your binders and simply pile papers with the correct binder. Once this is done, your work is naturally in sections. I took one section (binder) at a time and and just filed away that pile. If you want to label the dividers in advance you can, but it helped me to wait and see what was in my pile. That way I had a sure place for everything. You can spread this filing process out as much as you need since your piles are in sections now. I did one binder during a football game, one binder while chatting with my husband as he grilled dinner, etc. Breaks were needed in my case since it had been such a mess but try to work as quickly as you can and just get it done. Find ways to minimize what's coming in. Enroll in online statements or bill pay. Cut yourself off from catalogs and junk mail lists. Use Quickbooks instead of physically writing everything down. Use Evernote or write all notes in a notebook instead of loose sheets of paper or post it's. I know of a mom who takes photos of all her child's artwork and greeting cards so she doesn't have to save the actual paper. I also know there are scanners you can buy to make all documents digital. If you don't think you'll use it, don't save it. Try to be picky with what stays. Now I want to know, what rules do you have in your house to minimize paper clutter? Are your piles as bad as mine? Share below! Disclaimer: Affiliate links were used within this post and I may earn a commission for sharing. I do wholeheartedly recommend the products and services I share and all opinions are my own.